alaTest has collected and analyzed 20 reviews of Mach Speed Trio Stealth Pro 9.7C 4.0 ARM Cortex 1GB DDR3 Memory 8GB 9.7" Touchscreen Tablet PC Android 4.0 (Ice Cream Sandwich). The average rating for this product is 3.9/5, compared to an average rating of 4.5/5 for other products in the same category for all reviews. We analyzed user and expert ratings, product age and more factors. Compared to other products in the same category the Mach Speed Trio Stealth Pro 9.7C 4.0 ARM Cortex 1GB DDR3 Memory 8GB 9.7" Touchscreen Tablet PC Android 4.0 (Ice Cream Sandwich) is awarded an overall alaScore™ of 81/100 = Very good quality. 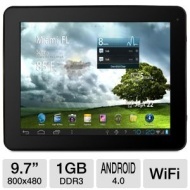 This tablet has limited WIFI range compared to the Samsung Tablet. Screen is slightly crooked but not so bad that is not useable. Overall worth the money for what I use it for. works very well at hotspots does everything i need at a low price ,nice to be able to use usb an minie card. It is a bit slow and the built in speakers are lousy. But if you use headphones or music is not important to you then it is not a bad buy. The large screen is good and the usb port is useful.